FM12240 Microwave for 12 volt DC and 240 volt AC operation. For those looking to replace older makes of 12 volt microwaves, our new FM12240 can be installed without any need to upgrade the batteries or charging system. Dimensionally smaller and lighter than previously available 12 volt microwaves, the FM12240 will prove to be an easy fit as a replacement or as a new install. The microwave is of conventional design, finished in white with a black plastic door window, glass turntable and is supplied with mounting/hold down brackets. Simple rotating dial controls for power and time settings means there is never a need to re-programme if the power supply is lost. The inverter is a separate high quality unit perfectly matched in output to the microwave. Additional 240 volt equipment should not be connected to the inverter. With the inverter switched on, the microwave can be operated in a similar way to a conventional domestic unit. However, cooking times will need to be increased by approximately 1/3 when compared to an 800w oven. Although cooking times are a little longer, the end result will be very comparable to a high power domestic oven but with the advantage of a lower power draw, this being far kinder to batteries. The FM12240 is supplied complete with mounting brackets fixed to each side of the oven, making for a rigid, secure installation. A conventional 13 amp plug connects to the inverter, heavy duty battery cables must be used between the inverter and the batteries. 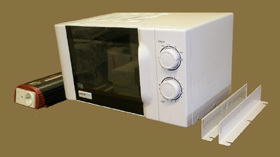 Contact Espar for information on 24 volt DC microwave ovens.